A group advocating for the ordination of women held a ceremony yesterday in a packed Protestant church at which it declared three women to be Catholic priests and a fourth woman to be a deacon. The ceremony, like several others that have taken place around the world over the past six years, was denounced by the Roman Catholic Church, and critics said the event was a stunt with no religious significance. 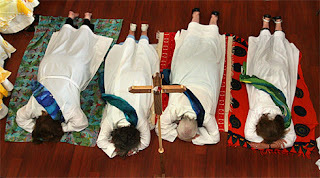 The Catholic Church has consistently taught that only men can be ordained as priests, and the Archdiocese of Boston said that the women who participated in yesterday's ceremony had automatically excommunicated themselves by participating in what it said was an invalid ordination ceremony. And the United Church of Christ is involved because????? The ceremony was held at the Church of the Covenant, which is affiliated with both the Presbyterian Church and the United Church of Christ. The interim pastor of the church, the Rev. Jennifer Wegter-McNelly, declared the ordination of women "an important part of this church's identity," and said "we stand with you today." The former president of the Massachusetts conference of the United Church of Christ, the state's largest Protestant denomination, was among several Protestant clergy who attended the ceremony to express their support for the women seeking ordination as Catholic priests. "Prejudice in liturgical clothing is still prejudice," said the Rev. Nancy S. Taylor, the former conference president, who is now senior minister of Old South Church. The ordination of women is "an important part of this church's identity." That's fine... but what does the ordination of catholic women have to do with the UCC? OK... the truth is no one has a clue as to why the United Church of Christ is meddling in the ordination of priests. It is one thing to open our doors and proclaim God's love for ALL of us, but it's quite a bit different when you tell other faiths what they should believe and how they should practice their faith. This doesn't seem right at all. What is ironic is that while UCC leaders go nuts over a phony conspiracy of church stealing by outsiders, we find ourselves also meddling in other faiths. You would think this would be obvious to Nancy Taylor who is considered by many to be a potential candidate for UCC General Minister and President. I can't help but wonder if there is a creeping anti-Catholicism bubbling in the United Church of Christ. A UCC church was involved because no Roman Church wants any part of this and they had to find come convenient venue for their "stunt". The UCC, despite all its talk of diversity, welcome, etc., HATES any church that doesn't ordain women or homosexuals. They are tolerant only so long as it is heretodoxy that is being tolerated. Admin: Pick a different blogger name or every post going forward will be deleted. Using a username such as "admin" is intentionally deceptive and someone might confuse your post with the admin of the site. Hmmm, as a woman pastor myself, I support any way the Holy Spirit calls people into public ministry. But the operative word here is 'public.' If these ordinations were 'furtive' and 'private' that in itself expresses a shadiness about this business. And that puzzles me; there should be a joy and openness to being called, chosen, and publicly proclaimed a pastor and minister of the gospel. That's the point of this charism: the public proclamation of the proclaimers of the gospel. If there's fear of 'authorities,' and a cowering behind locked doors, that's antithetical to the gospel. Who are these authorities that are feared? How can one be proclaimed a priest to an institution where it's authorities are feared! Makes no sense to me! Part of ordination is the vow to be obedient to one's bishop! But how can on be obedient to one's bishop if the candidate is going behind said bishop's back to particpate in an unauthorized rite? A huge part of Roman CAtholic piety is the hierarchical authorities. To flaunt the authorities tears down the system in which one desires to represent. As Groucho Marx may have said: Why do I want to be part of an organization that wouldn't want me as a member. What we have here are a group of women who they chose to engage in a game of make-believe because they can't take "no" for an answer. Does this really surprise anyone in this day and age? They blasted this story as far and wide as possible - why was it a story at all? Please Nancy Taylor - stay out of our way. I agree that woman should have the right to be ordained as priests, but this is an arrogant act. This self-righteousness will do nothing to convince the Catholic Church to change their ways. During the 16th and 17th Centuries there were many wars fought between Protestants and Catholics. Each side felt self-righteous that they were morally superior than the other. Both faiths need to stay out of the internal affairs of the other. I hope that this meddling is just an isolated incident.